The Women's Empowerment Summit is the event to empower you to be the best you! There are absolutely no limits to what you can achieve, especially when you’re equipped with the right tools, the right attitude and the right plan. At the event you will learn from leading experts who will give you the direction, the clarity and the focus you need to achieve your goals, and you will network with like-minded women who have similar goals to you. The day is full of meaningful insights, great people, and results that make a real difference in your life and business! Fluent in Irish, Sile has developed a wealth of experience over the past eighteen years in the media industry. And she’s added another string to her bow by becoming a certified yoga teacher. She has worked on a variety of successful and well-received projects for RTÉ, TV3, TG4 and Oireachtas TV in Entertainment, Daytime, Lifestyle, Factual, Young Peoples, Sports, Comedy, Weather and News and Current Affairs programming. Radio has also been a big part of her career having worked with Newstalk 106-108 , RTÉ Radio 1’s Today with Pat Kenny, ‘Walk in my shoes radio’, Beat 102-103, iRadio and Sunshine106.8. 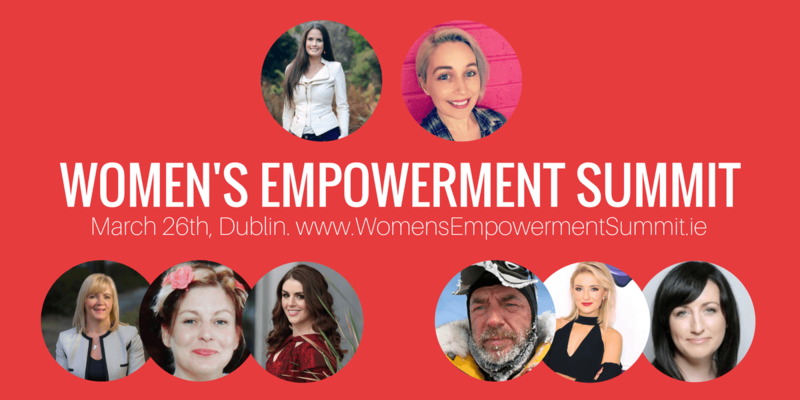 We are delighted to have Sile emcee The Women’s Empowerment Summit 2017! Donna is a three-time bestselling author and one of Ireland's most sought after speakers. She is a qualified psychologist, business coach and mentor and has worked with world leaders in the areas of personal and business development. Her research has been cited in university journals and her training programs are used by several leading companies and organisations. Donna is the “How-To” lady, if you want to improve your life or grow your business! She overcame huge adversity in her earlier years so you can be happy in the knowledge that the information she will share with you is proven to work in real life situations. This lady has your back and she can take you to the top! Vice President of Global Operations for PayPal EMEA, leading 2,500 teammates in Dublin, Dundalk and Berlin. Voted Ireland's Most Trusted Leader as awarded by A Great Place to Work. She is a non-Executive Director of Ryanair and board member for Voxpro and in 2014 she was President of the American Chamber of Commerce in Ireland. Denise is one of Ireland's best digital marketing experts. She has an honours degree in Information Technology and is renowned for her fresh approach to building business using platforms such as Facebook, Twitter, Instagram, SnapChat and email marketing. She is also the founder of The Irish Women in Business Network, a successful women's network that assists women all over Ireland in achieving their business goals, Her advice, trainings and expertise has been endorsed by some of the most prolific business women in Ireland and she has helped transform the lives of many “Mumpreneurs” all over the country. Pat also lived with and studied over 20 tribes world-wide, from western man, to nomadic tribes in Africa, to the stone-age tribes in the jungles of West Papua New Guinea. From them, he has discovered fascinating similarities and traits in all of human beings: to challenge, to change, set goals, and to achieve them. Among these various tribes and cultures he has studied what exactly has driven people to succeed. Pat covers an area that will help you endure the tough times and build a solid team around you so you achieve your goals. Katie Molony is CEO of Maximum Media, Ireland’s fastest growing online publishing company and the parent company of Her, JOE, SportsJOE, & HerFamily. Since joining from The Irish Times almost three years ago, Katie has played an integral role in driving Maximum Media’s success in both the Irish and British market. Katie has not only brought outstanding marketing expertise and raised the bar in terms of quality, she has also been a driving force in the company tripling the work force and fostered a wealth of new talent within the organisation. It is with thanks to Katie’s leadership that the launch of JOE.co.uk was a resounding success, laying the foundations for the phenomenal growth in the UK market over the last 22 months. Katie holds an MSc. in Marketing from DIT, a Diploma in Online Marketing with Advertising and Public Relations from Fitzwilliam Institute, a B.A. in Business with Arts Management from IADT, Dun Laoghaire and most recently completed The Trinity International Growth Programme. Katie is also on the board of Business to Arts. Nikki was diagnosed with a rare form of bone cancer (Ewing’s Sarcoma) at sixteen and received a second total right hip replacement at the age of twenty six. She is currently one of less than ten people worldwide to have lived through what she has. Despite her challenges, Nikki has scaled the Sólheimajökull glacier on crutches, attempting a Guinness World Record in Holland to become the fastest woman to complete a 5k on crutches. She has abseiled off one of Ireland’s most iconic lighthouses, Fanad Head in Co. Donegal and she is the second person on record to complete the Fan Dance Race Series on crutches. Red Bull reached out in February 2017 to capture her story of inspiration in extreme sports, she has been nominated for an Outsider Magazine award and she is the winner of one of Ten Outstanding Young People awards in Ireland. Susan is a Google Expert from Manchester who has been specialising in the use of Google since 1999. Having lived in Seattle (Bill Gates' Hometown), she studied the impact of the World Wide Web from its infancy, in particular Google Organic Search. Now Susan works with clients all over the world to secure permanent Page 1 SERPs on Google, Bing and Yahoo! She was also a former advice consultant to the British Government and is a mentor to the young Leaders Commonwealth Programme, not to mention that this lady has nearly half a million followers on Twitter. You're in for a treat!